This coming Ash Wednesday I will be giving a talk on medieval liturgy at Whitworth University in Spokane WA. As part of that visit, I will be celebrating the Blessing of Ashes and the Dominican Rite Low Mass of Ash Wednesday (St. Francis Xavier Catholic Church, 3715 North Standard Street, Spokane, WA, 11 a.m.). This combination caused me to think about an issue that had never occurred to me: How would one combine Blessing of Ashes and Mass according to Dominican practice in 1962. 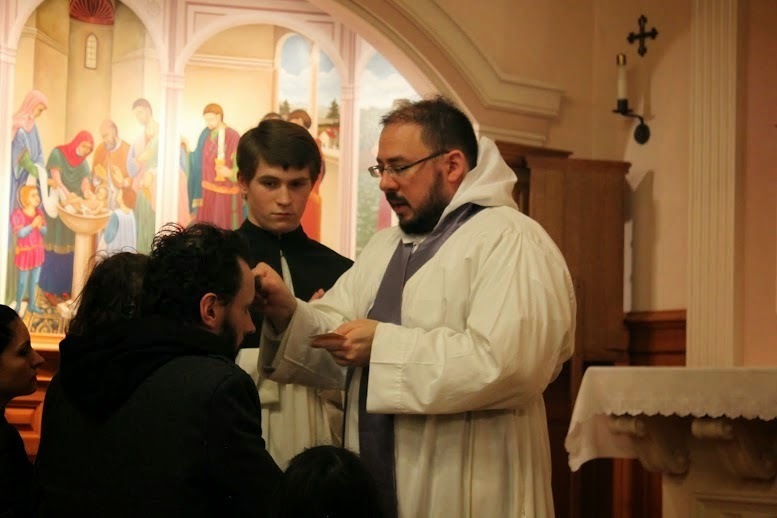 Some of our parishes in the Western Dominican Province have celebrated Ash Wednesday ceremonies using the Dominican Rite, but it has always been a Sung Mass and the Ashes were blessed by the prior, not the Mass celebrant. See image to left above where, last year, Fr. Steven Maria Lopez, O.P., Prior of Holy Rosary Priory, Portland OR, is blessing the ashes at a table on the Epistle Side. He is assisted by servers of the parish and the celebrant, Fr. Vincent Kelber, O.P., parochial vicar. In this ceremony, which I on which I have already written this post, the Blessing involves various chants, beginning, after the Seven Penitential Psalms, with the antiphon Ne Reminiscaris and its verses and collect, the Absolution, the blessing itself, and the imposition of ashes, during which other antiphons are chanted. The Mass then begins with the return of the ministers who omit the Prayers at the Foot of the Altar. The priest ascends, kisses the altar, makes the silence Sign of the Cross, and goes to read the Officium (Introit) at the book. Those interested in the Solemn form to compare it to the Roman may consult the previously mentioned post. It is probably best, should ashes have already been blessed for the parish or priory, to use those ashes blessed earlier and skip the blessing. The Dominican imposition ceremony could, of course be used. But, should there be reason to bless new ashes at a Low Mass, a couple of problems arise when the ceremony is conducted without music by a priest alone with only one server. Fortunately, the Missale Ordinis Praedicatorum (1965), p. 40, resolves some of the questions, but on at least one it is silent. If the solemn blessing of ashes is done separately [i.e. not connected to the Penitential Psalms], it is permitted to bless the ashes in the morning using a simple form, without the Penitential Psalms and without chant. This form can be used even where the sacred ministers [i.e. deacon and subdeacon] and chants cannot be found. So, the rite would be performed perserving only those aspects of the solemn form needed for a simplified rite of blessing alone. Here follows my suggested order of service. 1. In preparation, a covered table is placed on the Epistle side at the foot of the steps. On it would be the container with ashes and the holy water with sprinkler. 2. The priest vests, as the prior would have, in surplice and stole (unlike the Roman, no cope is worn in our rite for this or the Asperges---although this might be done pro causa solemnitatis, but that Romanism is not my choice). The server, carrying the Missal, leads the priest to the altar. The customary reverence (bow or genuflection) is made. They go to the table, where the priest faces the table and altar, and the server stands to the left side of the table facing the priest (as the deacon would in the solemn form). The priest opens the book (servers do not do this in our rite). 3. The priest reads the blessing Omnipotens sempiterne Deus, with the server responding. The priest then sprinkles the ashes with holy water. Those who want to read this blessing my consult the post already mentioned. 4. After bowing to the cross or tabernacle, the priest and server go to distribute ashes to the people. If there is a priest available to impose ashes on the celebrant, this should be done first. 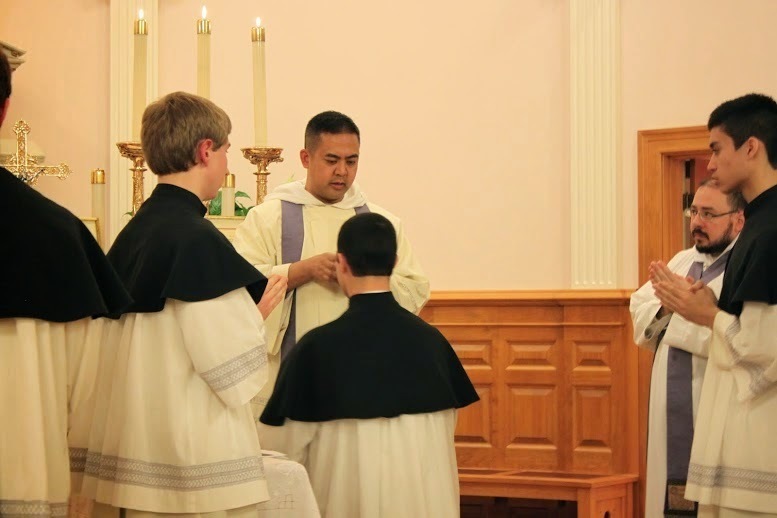 The priest uses the traditional Dominican formula: Meménto quia cinis es, et in cínerem revertéris ("Remember that you are ashes, and to ashes you will return"). I think it suitable that the server follow after the priest, sprinkling each recipient with holy water, as the celebrant would do when the prior distributes ashes in the solemn imposition. 5. The priest and server then return to the altar and bow. The server drops off the holy water on the little table and takes the Missal. Both make the customary reverence and go to the sacristy. 6. While the priest vests for Mass, the server returns, makes the customary reverence, and removes the little table with the ashes and holy water. He then returns to the sacristy to pick up the Missal and precede the priest to the altar. It is possible, I guess, to have the veiled chalice already on the altar, but that would really follow Solemn Mass rubrics, not those of Low Mass or even of the Missa Cantata. 7. The server, carrying the book, leads the priest, with the chalice and his amice covered capuce up, to the altar. They make the customary reverence. The priest ascends to the altar, uncovers the chalice, opens the corporal, and goes to the Epistle side to prepare the chalice. The server meanwhile has placed the Missal on the stand, and retrieved the cruets. The priest makes the chalice. He then goes to the center and lowers his capuce. 8. The server having taken his place on the Gospel side opposite the Missal, the priest makes the silent Sign of the Cross and goes to the book to read the Officium (Introit) and Kyrie. The Mass then continues as usual. Note, however, that the Flectamus genua precedes the Opening Collect and that the Prayer over the Faithful is added after the Postcommunion (as on all ferials in Lent). Since 1960, the extra collects (found in the 1933 Missal) are omitted, and the Benedicamus Domino is replaced by the Ite missa est, unless a ceremony immediately follows after Mass, which would not happen today. I hope that friars who have the opportunity to bless ashes and say the traditional Dominican Low Mass this Ash Wednesday find this helpful. Also remember that a Dominican Rite Mass of the Immaculate Heart will be celebrated this Saturday in Oakland CA as announced here.